The opioid drug abuse crisis isn’t going away with 2016’s end. If anything, even as the nation has just committed $1 billion to combating this scourge, news reports are disclosing how Big Pharma made it even worse than had been known in at least one ravaged state, and how industry players are threatening to export it so it becomes an international nightmare. Further, industry leaders may be undercutting federal law enforcement efforts crack down on its illegal aspects. The Los Angeles Times has landed yet another of its string of powerful investigations into Purdue, the family owned maker of OxyContin, one of the powerful painkillers at the heart of the prescription drug abuse crisis. The paper finds that Purdue responded to a tide of adverse publicity and declining sales in the United States by reorganizing its efforts into a web of related companies overseas, all under the umbrella name Mundipharma. In Brazil, China and elsewhere, [Mundipharma] companies are running training seminars where doctors are urged to overcome ‘opiophobia’ and prescribe painkillers. They are sponsoring public awareness campaigns that encourage people to seek medical treatment for chronic pain. They are even offering patient discounts to make prescription opioids more affordable. The drug maker also is sending around the world American physicians whose credentials get burnished to make them seem more authoritative as they pitch the virtues of prescription painkillers in seminars and other professional sessions. These experts and Mundipharma’s OxyContin hype downplay or ignore how addictive OxyContin can be. The Los Angeles Times says Mundipharma, if unchecked, could replicate the opioid drug crisis in Latin America, Asia, the Middle East, and Africa. Many of the markets it is targeting are in poorer, less developed nations little able to handle their existing, huge public health challenges, much less the havoc that opioid drugs have created in America, where the paper says 200,000 lives have been lost to painkiller abuse and overdoses. Although the recently approved 21st Century Cures Act allots $1 billion to combat opioid drug abuse and the Obama Administration has urged officials to tap those funds quickly and put them into action, new revelations about the staggering scale of the United States’ own challenges continue to emerge. I’ve written how state officials and the Charleston Gazette-Mail, a small West Virginia newspaper, with civil lawsuits, had forced Big Pharma to start to show how it flooded poor, desperate small towns across the state with tens of millions of painkiller pills. But the paper has just upped the ante considerably, reporting that, “In six years, drug wholesalers showered the state with 780 million hydrocodone and oxycodone pills, while 1,728 West Virginians fatally overdosed on those two painkillers.” The paper points out the obvious: there was zero chance that Big Pharma had any reason to think the powerful and addictive drugs were in appropriate use—and the Charleston Gazette-Mail questions why more pharmacists and state regulators did little as a tsunami of potent and suspect medications inundated small towns and turned lethal. 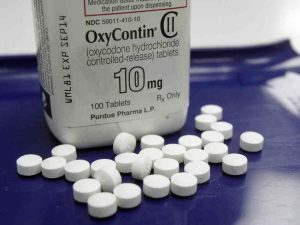 If regulators and law enforcement officials may have seemed slow to deal with the opioid drug crisis, a Washington Post investigation may provide insight why: The paper says that since 2005, when the federal Drug Enforcement Agency began to attack illicit sales of pain killers like oxycodone, Big Pharma has targeted the drug cops’ top echelons, recruiting and hiring away 42 of the agency’s brass. The specific DEA division that seeks to curb illegal medication sales got picked clean by Big Pharma of 31 of its leaders, the Post says, detailing how the agency’s aggressive attack on prescription painkillers slowed as it leadership ranks thinned. Although federal law seeks to curb or even to bar “revolving door” employment, where those with oversight over an industry leave the government and go to work in it, Big Pharma executives and the few former DEA staffers, who were contacted by the paper and who would be quoted, insisted they had followed applicable regulations. Let’s be clear: besides Big Pharma, physicians have played a terrible role in this health menace, whether their intentions were good (to relieve pain) or no. The Washington Post and the Kaiser Foundation, with a national survey and follow-up reporting, have found that opioid drug users get started with the drugs via their doctors (97 percent of respondents). They report they suffered great pain from accidents, surgeries, and diseases like cancer, and the opioids offer them initial and dwindling relief. But increasing numbers find themselves quickly hooked on the drugs, with many advancing to increasingly powerful and often illicit opioids, including super designer drugs like fentanyl, and illegal heroin. Some respondents, roughly a third said they use the drugs now to get high or to relieve stress. Those who now struggle with addiction include infants, especially in rural and poor areas, and unsuspecting seniors. I’ve written before how physicians, regulators, policy-makers, politicians, and, yes, Big Pharma must step up to deal with the opioid drug abuse crisis. A great deal of credit is due to the journalists and news organizations that are dogging this woe. I look forward to the follow-up by U.S. public health leaders to aggressively clue in their global counterparts about the terrible harms that opioid painkillers have caused in this country. We should all look for congressional leaders to ask tough questions about Big Pharma and the DEA, and I hope that West Virginians put their public officials on the griddle as to why state laws didn’t do more to prevent a drug inundation. I certainly see in my practice the tragic effects that can result from dangerous medications, and I know all too well from decades of experience with Big Tobacco how insidious it can be for high-powered American corporations to move their avarice around the globe. We’ve got a lot of work to do in 2017 to tackle this crisis and others to improve our health.